Mindy's fitness Journey: Time to Jump on the Weight Loss Train!!! This train is leaving the station, friends... again! 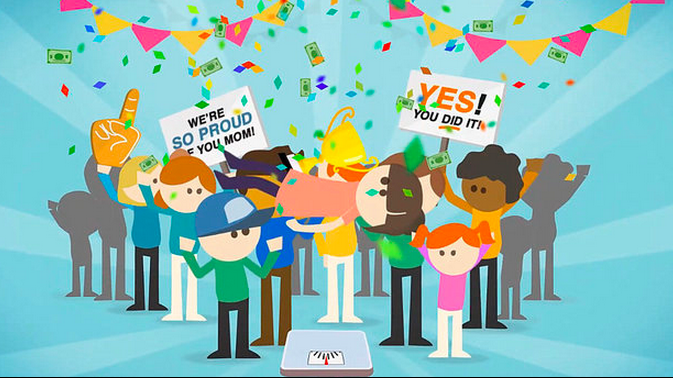 As we wrap this first DietBet for Mindy's Fitness Journey, that totaled $15,765, another one is beginning! The Dietbet that is almost over right now has a Total weight lost of 2,908 pounds and we still have a little under a week! It's time to jump on this train folks! How nice is it to lose weight and make money. What this video to see how easy it is! This is legit. I have already done 3 Dietbets. I am making money and having fun. I also have a facebook group you can join for extra support. Join Mindy's Diet Bet Support Group HERE! Let me first tell you that I love to gamble, but I am THE WORST gambler in the history of the world. I would be better off skipping casinos and just flushing my money down the toilet. It's that bad! But with the DietBet, I am in charge, and I WILL win! This can't even be considered gambling. I consider it an investment in myself. 2. Two days before your games begins, you will be prompted to submit your official weigh in. You will need a scale (preferably digital,) a camera or smart phone, and a full length mirror or someone who can take your picture. You will submit 2 photos. One of you on a scale in "airport security attire" (I think that means they want you comfortable and appropriate... lol) and another of the scale's readout with your "secret" weigh in word. (you will do this same process when the bet ends. The secret word will be different.) 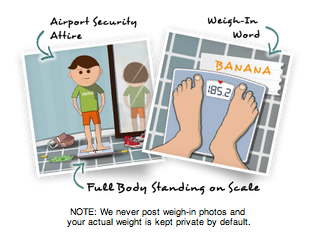 Your weight can be private, and NO ONE (not even me) sees your pictures. They WILL NOT be published. 3. Now all you need to do is lose 4% of your body weight. So if you weigh 200 lbs, you only need to lose 8 lbs in 28 days... totally doable!!! From the official DietBet site. We have a photo review process in which players submit proof of their initial and final weights to our team of Referees. 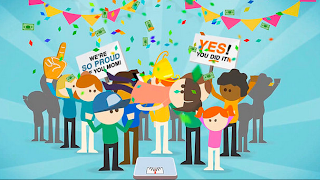 We also have algorithms that detect unusual activity within a game or across games and use an auditing system where some players may be required to submit extra proof of their weight loss using: a Skype weigh-in with one of our Referees, a video weigh-in, or an in-person weigh-in at a location pre-approved by DietBet, such as a Walgreens or CVS clinic. If requested, you will have to submit further proof of your weight within 24 hours. Since weights fluctuate naturally, we allow up to 1% of your final weight as variance for your audited weigh-in only. This variance does not apply to the standard final weigh-in. Failure to comply will result in disqualification and forfeiture of your winnings and initial bet. You may also be banned from playing again and subject to other penalties. To see the legal fine print, click here. *disclosure: DietBet paid for my entry into this DietBet. that blog is really awesome posting i like it very much and i have to fit to did daily work out ..